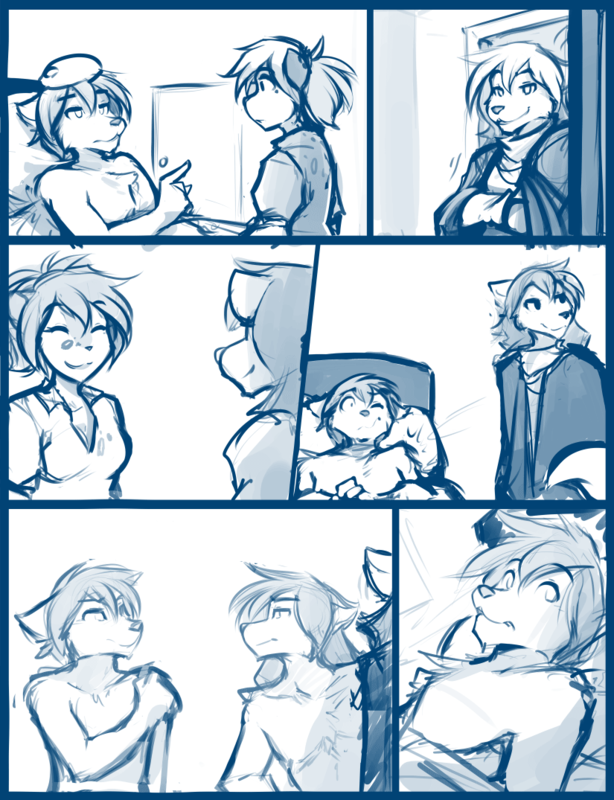 1034: Assassin Siblings, Catching Up, Pt 1 - Twokinds - 15 Years on the Net! Zen: Oh, good. My dear brother has arrived. Zen: He’s on the other side of the door trying to think up leg puns. Natani: Hey, Kat! Nice shirt. Kathrin: Oh right, that… mind-thingy. Kathrin: Eheh… T-thanks, Natani. Zen’s looking good so far. Just a mild fever. Kathrin: I know it’s been a while. I’ll leave you two to catch up. Call for me if you need anything! Zen: You know, hitting me in here doesn’t actually do anything. Natani: Yeah, well… I’d feel bad actually hitting oyu while you’re already injured. That’s for being an idiot, getting that damn shackle put on in the first place. Zen: Yeah, I know, I know, believe me. I messed up, I’m sorry. Zen: But… it all worked out in the end, right? So, are you going ot fill me in on what I missed? Your memories are… more closed off than usual.